Kate Acuff speaking at The Center in Charlottesville. Kate Acuff was elected to the Albemarle County Public School Board in November, 2013, as the representative from the Jack Jouett Magisterial District. Ms. Acuff, who is a health policy consultant, serves on the Board of the University of Virginia Physicians Group, on the Board of Mental Health America-Charlottesville/Albemarle and on the Steering Committee of the Community Mental Health and Wellness Coalition. She previously was a consultant to the Virginia Supreme Court’s Commission on Mental Health Law Reform, an adjunct assistant professor in Emory University’s School of Public Health and a vice president of policy and education with the National Public Health and Hospitals Institute. Ms. Acuff is a strong advocate for providing safe and healthy learning environments in schools. Among her priorities is to support collaborative programs among students, parents, school staff and other members of the community to continue the division’s progress in its bullying prevention programs. Ms. Acuff also believes that access by students to pre-K instruction should be expanded to reduce the opportunity gap among children in Albemarle County. A native of the Midwest, Ms. Acuff is a graduate of the University of Tulsa. She received her Master’s in Microbiology & Immunology from the University of Colorado and her Ph.D. and a M.P.H. in Public Health and Public Policy and Management from Johns Hopkins School of Public Health. She also earned a J.D. from Georgetown University. Ms. Acuff spoke at the Wednesday January 9, 2018 meeting of the Senior Statesmen of Virginia. The meeting was held at The Center in Charlottesville. Following the presentation, questions were taken from the audience. 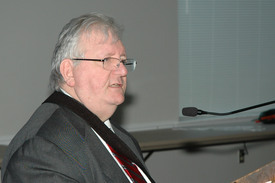 The program was moderated by SSV president Rich DeMong. The 2017 federal tax law changes were controversial from the beginning. The bill was essentially written in secret, without the benefit of public hearings, and opponents, though they hadn’t seen even a draft, lambasted the bill as a giveaway to “the rich” that would massively increase the deficit and the national debt. 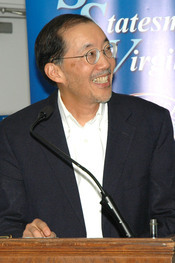 George Yin, an expert on federal tax law, presented a balanced assessment of the bill’s likely consequences on individuals, on businesses and on the economy. 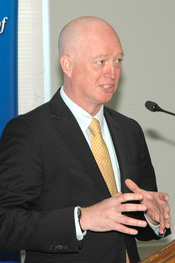 His analysis includes both a lay explanation of tax-law arcana such as “the Byrd rule” and an even-handed, practical critique of the assessments of the bill by its supporters and its opponents. Mr. Yin spoke at the Wednesday September 12, 2018 meeting of the Senior Statesmen of Virginia. The meeting was held at the Senior Center in Charlottesville. Following the presentation, questions were taken from the audience. The program was moderated by SSV board member Bob McGrath. Some of the most contentious and significant issues facing the United States today involve immigration. It’s not just, or even primarily, about the “dreamers” (undocumented people who were brought here as minors). The issues involve more basic questions, such as what the level of overall (legal and illegal) immigration should be and what categories of immigrants should be preferred and the national-security and economic implications of various immigration policies. Farrell and O’Brien speaking at the Senior Center in Charlottesville. In this podcast, Cathleen Farrell of the National Immigration Forum and Matt O’Brien of the Federation for American Immigration Reform speak to the issues facing immigration policy makers today. 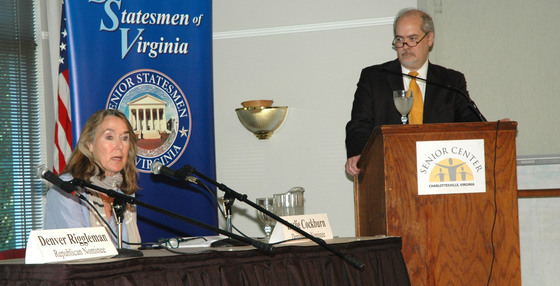 Farrell and O’Brien spoke at the Wednesday June 13, 2018 meeting of the Senior Statesmen of Virginia. The meeting was held at the Senior Center in Charlottesville. Following the presentation, questions were taken from the audience. 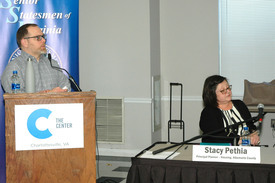 The program was moderated by SSV board member Terry Cooper. The 2018 Session was very different from other recent Sessions. Topics include the impact of the 2016 Presidential election of Donald Trump on the 2017 legislative elections, in which Democrats came within a hair’s breadth of capturing control of the House of Delegates, and on the 2018 General Assembly Session. Also discussed are the 2018 federal elections, the 2019 General Assembly Session and the 2019 legislative elections. In this podcast you will learn about issues that came before the 2018 General Assembly including: Medicaid expansion and the proposed work requirement for able-bodied Medicaid recipients; the proposed hospital tax to help pay for Virginia’s share of the cost of expanding Medicaid; efforts to reform the redistricting process and end gerrymandering; bills to protect the integrity of our elections; measures to make the criminal-justice system fairer; and, locally, legislation affecting the City-County Revenue-Sharing Agreement and the relocation of the County’s courthouses. Senator Creigh Deeds and Delegate David Toscano speaking at the Senior Center in Charlottesville. The delegates at the Wednesday May 9, 2018 meeting of the Senior Statesmen of Virginia. The meeting was held at the Senior Center in Charlottesville. Following the presentation, questions were taken from the audience. 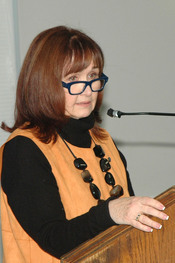 The program was moderated by SSV board member Terry Cooper. 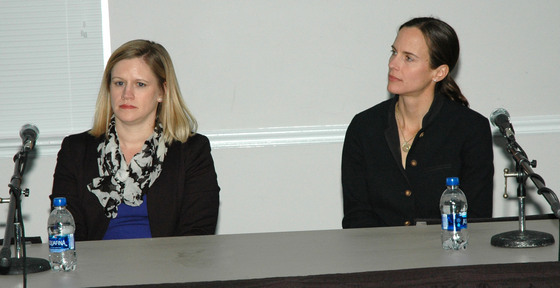 Jessica Foley and Nora Seilheimer speaking at the Senior Center in Charlottesville. Unfortunately, taking a new therapeutic medical device from concept to standard of care is an extremely slow, complicated and inefficient process. The Focused Ultrasound Foundation is working to provide patients with the focused ultrasound option in the shortest time possible. It has become a model of how donor funding can be used to bridge the gap between laboratory research and widespread patient treatment. In this podcast you will learn about some of their early success stories. Jessica Foley is a veteran of the ultrasound field and guides the strategy, development and implementation of the Foundation’s scientific and research programs. She holds a B.S.E. from Duke University and a Ph.D. from the University of Washington. Nora Seilheimer is a graduate of the University of Richmond and is engaged in development work for the foundation. 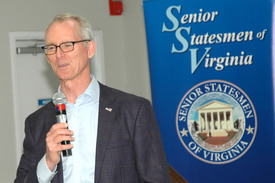 The event took place at the Wednesday April 11, 2018 meeting of the Senior Statesmen of Virginia. The meeting was held at the Senior Center in Charlottesville. Following the presentation, questions were taken from the audience. SSV vice president Terry Cooper moderated. 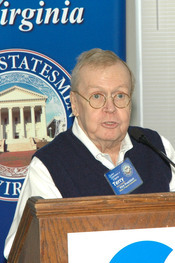 Pat Nolan speaking at the Senior Center in Charlottesville. When violent-crime rates spiked in the 1980s and early 1990s, the response of most states and the federal government was to toughen criminal laws by abolishing parole, legislating lengthy mandatory minimum sentences, reducing “good-time” credits that shortened sentences for inmates who obeyed prison rules, making prison life even more miserable and building more prisons. The incidence of crime dropped dramatically and rates are now back to where they were before the spike, there are differing views about why this has happened, but the social and economic costs of those lock-’em-up-and-throw-away-the-key laws were enormous. What’s more, the offenders weren’t being diverted from a life of crime. “Criminal justice reform” is the umbrella term for a wide variety of proposals that attempt to reverse erroneous convictions and also get offenders out of the criminal justice system and into a law-abiding, productive citizenship. 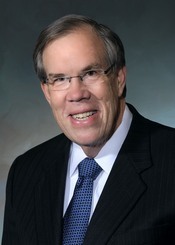 Pat Nolan is a nationally recognized leader in this movement. Pat is the director of the American Conservative Union Foundation’s Center for Criminal Justice Reform and a leader in the Right on Crime project, a movement of conservative leaders who advocate for criminal justice reform. Before that Pat served 15 years in the California State Assembly, the lower house of the California legislature. For four of those years he was the Assembly’s Republican Leader. Pat has personal experience with the criminal justice system. He was prosecuted for a campaign contribution he accepted that turned out to be part of an FBI “sting.” He pled guilty to one count of racketeering and served 29 months in federal custody. Pat will describe how some states have been finding ways simultaneously to reduce prison populations, shrink recidivism and lower costs and discuss proposed federal and Virginia legislation with similar goals. Pat holds bachelor’s and law degrees from the University of Southern California. He and his wife Gail reside in Leesburg. The event took place at the Wednesday March 14, 2018 meeting of the Senior Statesmen of Virginia. The meeting was held at the Senior Center in Charlottesville. Following the presentation, questions were taken from the audience. SSV board member Bob McGrath moderated.